"...a lot of the same topics and same themes [as the first 2 mixtapes] but it sounds a lot bigger...It’s a lot darker, edgier and louder." 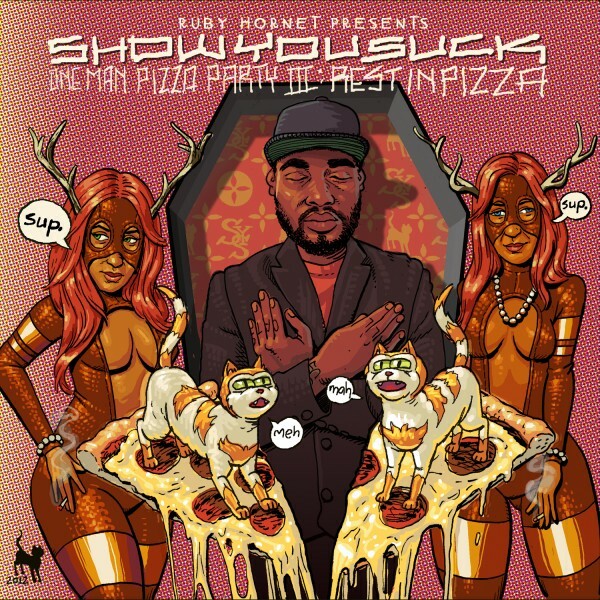 ShowYouSuck has recently returned from a tour with Shady Record's Yelawolf (off of the strength of his Chicago opening set no less) and with this latest release it seems that his success shows no signs of slowing. With his everyman appeal and DIY ethics you can expect more big things to come from this Chicago rapper. OMPP3 has a whopping 26 tracks and features production from his longtime collaborater Mike Jaxx. It also has guest verses from Brooklyn's Mr. Muthafuckin’ eXquire (on the surefire hit "Carne Asada") Grade A Plus, his hypeman Auggie The 9th and fellow Treated Crew member Hollywood Holt. Download One Man Pizza Party III: Rest in Pizza here.